...and that was about it. I felt awkward in accessories. About the only things I owned was a string of pearls (beautiful 'real' ones, a wedding gift from my husband), my engagement/wedding/eternity ring set and an antique emerald ring. That was the extent of my accessory wardrobe. I even hated wearing belts. These days I collect accessories like some people collect stamps or coins. You can never have too many scarves, necklaces, earrings, bangles, stockings – simple little touches which can transform an outfit. I guess that sounds tremendously indulgent - however I've found having a range of accessories means that I need less clothes... simply because I can transform my existing pieces into new looks. When I'm feeling weary of my wardrobe I just think about how else I could wear a piece of clothing and dive into my jewellery, belt, shoe, scarf or jacket piles and see how I can 'shake things up'. I pick things up in sales, bargain bins, holiday trips, markets, charity shops - all sorts of places. They are rarely expensive - yet prove to be some of my best wardrobe investments. I think it’s great to sew yourself sensational clothes. I think it’s even better to learn to wear them well. I rarely sew or purchase anything without thinking about the complete overall look. I see a fabric or a garment and picture the shoes, the belt, the bag and so on. It’s not just a piece of clothing, it’s a package deal. I know plenty of people who have amazing clothes. Expensive, well cut, designer clothes. That doesn’t always make them stylish or interesting - just well groomed in some cases. ‘Wearing the clothes’ rather than letting them wear you is the key I think. I am often questioned on the clothes I’m wearing – often by strangers. 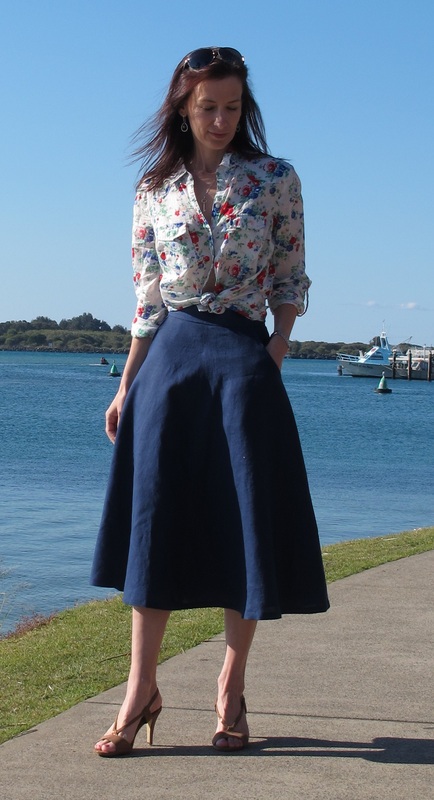 I’ve got a very diverse mix of designer, homemade, vintage and charity shop pieces – I tend to wear them mashed up - and with a variety of accessories. I often select one statement item and then build the rest of the outfit around it. You can get ‘too busy’ in a visual sense. It’s important to figure out what the key element is and make sure it sings, rather than competes with everything else you are wearing. Any opera singer will tell you – there can be only one diva! 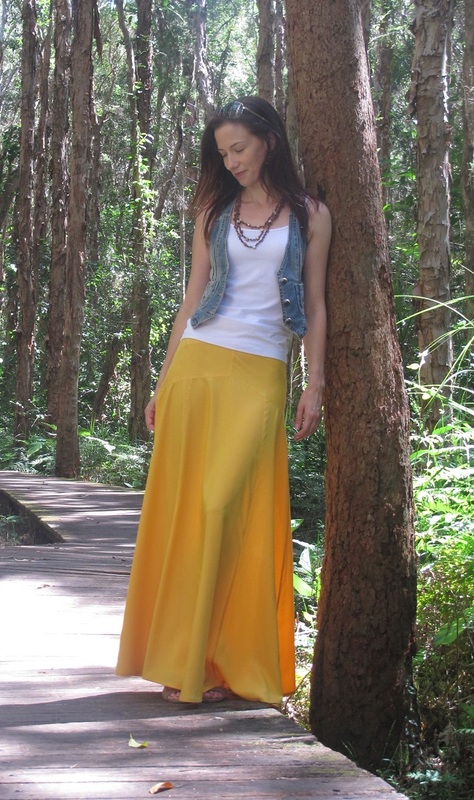 Here it is clearly the vivid yellow skirt (Sewaholic Gabriola) but the denim vest and some simple beads tone it down and bring the outfit together. 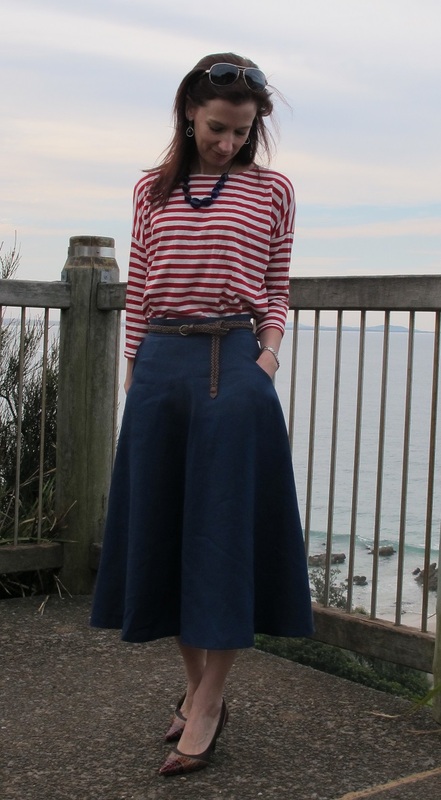 A really lovely casual skirt. I think I could wear this anywhere. Scarves are a great all year round accessory. Growing up in a climate which doesn't really require a winter-weight coat, scarves did take me awhile to 'get'. It was a trip to England many years ago when I realised how to wear scarves and hats well - over there they are essential to ward off those CHILLY winds!! Back here they do help in winter but they are also a simple way to jazz up a plain outfit. I tend to favour block-coloured clothes so I tend to favour multicoloured scarves. I like how you can use them to add more texture and interest to an outfit. I do have some plain scarves and I tend to wear them with patterned clothing, a simple scarf can 'calm down' a crazy pattern or create a focal point. I also love crochet lace scarves. However scarves don't have to just be 'winter wear'. 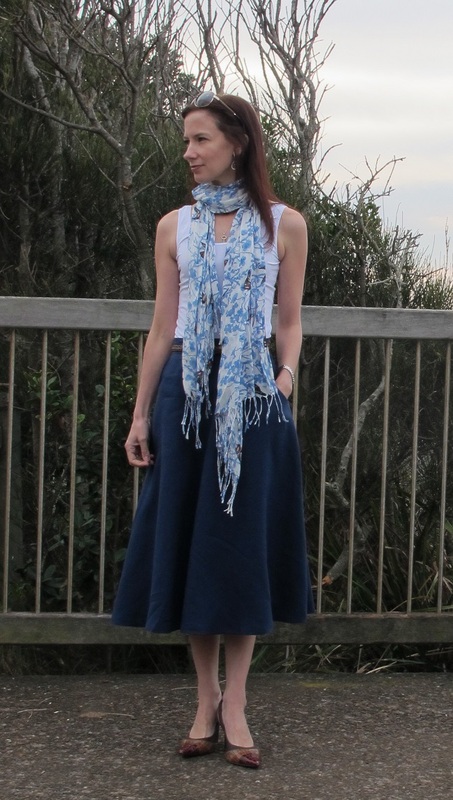 I love to wear a light-weight scarf with a t-shirt and jeans, or simple dresses. I remember seeing a friend and thinking 'wow she always looks so 'together'' and I realised the major difference between our appearance was I rarely saw her without a scarf draped around her neck or a lovely boho necklace. I realised this while we were sitting watching our kids play in the park - so it's not like it was a glamour event. However she always looked 'everyday' fabulous and I adored it. While I adore blue and own lots of blue clothing, I tend to steer away from wearing blue accessories. Rather I choose colours that highlight or tone with my blue wardrobe. Then again I do often slide back into my blue obsession as you can see above! Of all the items in my accessory wardrobe necklaces probably were the hardest to get the hang of. Yes I know you just hang them around your neck but they always felt obvious and just weird. 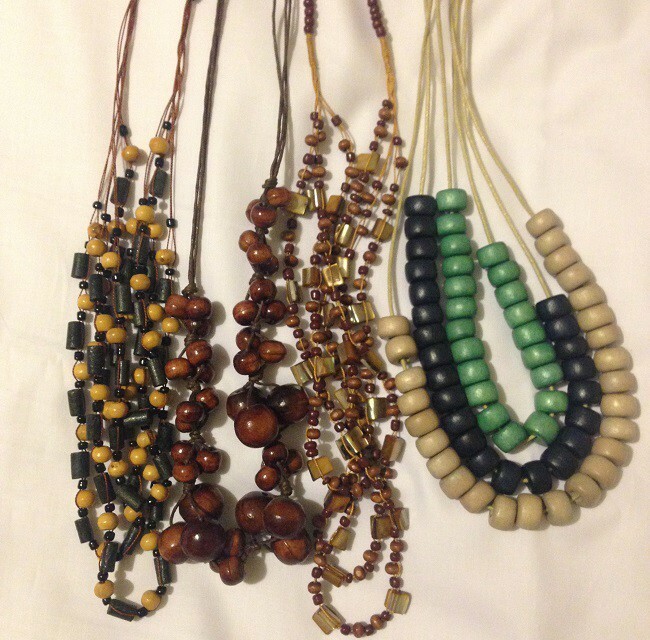 Then I discovered necklaces with wooden beads or natural earthy tones. For some reason these felt less obvious on me. So I guess the key is to find something that works with much of our wardrobe and branch out from there. I now have several chunky colourful necklaces and lots of silver, boho necklaces. I do have preferences. I don't like chunky beads around my neck. I prefer necklaces to hang around my clavicles/base of my throat. Anything too large just looks comical on me - however I have friends that can wear massive statement necklaces and look beyond fabulous. Sometimes you just don't need anything at all - as the clothes are enough by themselves. Sewaholic Hollyburn with a floral shirt. No accessories needed as the shirt is busy enough. Now I know technically jackets are a piece of clothing. I suffer from a major jacket fetish and I think this is because I like to use them to an outfit up or down, or totally transform an outfit. Think about jeans/white shirt with a corporate fitted black jacket... and jeans/white shirt with a khaki utility jacket... and you see what I mean. During the colder months I tend to have two jackets in circular every day. I have the jacket I wear from the car into the office with a scarf. Then I have the soft/warm jacket I wear around the office... and sometimes another casual jacket if I am doing 'mum' duties after work or catching up with friends.... plus I have a corporate jacket on 'stand by' for meetings... I love that with the shrug of my shoulders I can change a work outfit from corporate to casual to after-work drinks, courtesy of a good jacket choice. I have five core jackets in my wardrobe (and many variations on the theme!) and yes at the moment they are RTW - they are in good condition and I see no point in sewing something which doesn't need replacing. Trench coat - these are never out of fashion for good reason. I have a classic one and a vivid blue one. 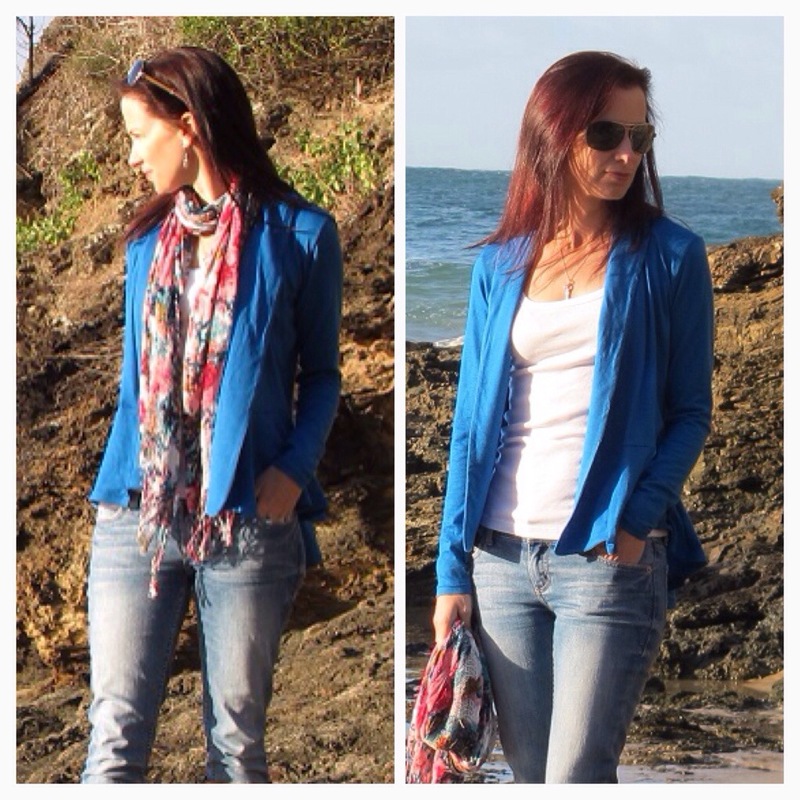 Denim jacket - these last forever and the older the better! Mine was a vintage find for the princely sum of $5. I also have a denim vest which I like to put over tank tops in summer for more coverage. Black bomber jacket - I adore bombers - always have. I wear them casually and with my corporate clothes. Khaki utility jacket - I consider khaki one of the great neutrals of the wardrobe world. A sorely unrated colour and a utility jacket is just the most perfectly casual and practical of all jackets. Black fitted corporate jacket. I find you can transform pretty much anything with an amazing black jacket. I love them for work functions... I feel much more comfortable and confident wearing a stylish jacket with a cocktail dress when I'm being 'work me'. I'm sure there are other jackets that you might find essential - it all depends on your climate and lifestyle. These ones are in regular rotation in my life and each one can transform an outfit, taking me from 'mum duties', to work, socialising and more. Rather than getting changed for every social event during a day, I often just change my jacket. Now I could go on forever about accessories - these three are just my favourites and the ones that I am most comfortable with. Who knows in 2015 I could have a new accessory obsession! Watch people, when you see a fabulous woman... study what she is wearing. She might have a killer necklace, or stunning shoes, a patterned scarf that just pulls her outfit together. It's really that simple sometimes. Never fiddle. There is nothing worse than watching someone fidget with a scarf, necklace or endlessly tug at a jacket. Be comfortable in your own skin. Signature pieces - something that says something about you. At the moment it's unusual to see me without my fine silver chain & key around my neck. I leave it on regardless of what I wear with it. It has significant personal meaning to me. Use tools such as Pinterest and Polyvore - these are great for inspiration, messing around with combinations or checking out other people's ideas. I've also found them a very handy tool to define and understand my own style... I clearly have a great love of denim, khaki, boots and draped clothing at the moment! Be brave. I was having lunch with some sewing people recently and we were discussing makes. Someone said 'oh I won't have anywhere to wear that' and I said 'I used to think that - then I realised that it's about confidence. I've seen some extravagantly dressed women walk into a theatre foyer - and everyone just goes WOW. I agree that many people would be thinking 'that's over the top' or 'I could never wear that' or some even make snide remarks... but more often people are secretly envious. Everyone does want to wear it - she just had a courage'. Be brave - embrace your inner accessory goddess and let her shine! A very enjoyable read indeed! (You're no slouch with your writing style yourself, you know Jane...which is why I enjoy your posts so much!) I smiled when I read the "Never fiddle" tip - whenever I see someone who does, it reminds me of a wonderful scene in "Pretty Woman". Cheers from Brisbane, Aust. That's such a good movie... gold never tarnishes! Thank you for sharing your thoughts here. I like your style and your attitude about dress. You've inspired me. Thank you - I hope you look at your wardrobe with new eyes (and perhaps succumb to the odd belt and necklace purchase!). Enjoy! Great article -- thanks so much for sharing!